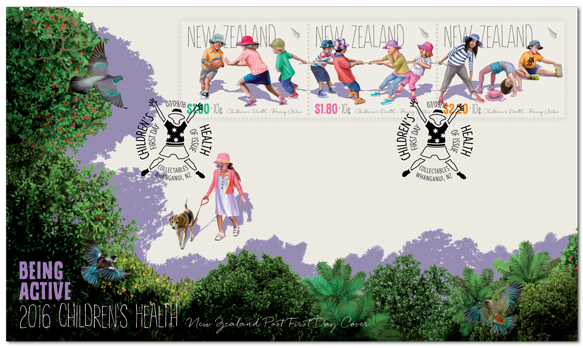 Virtual New Zealand Stamps: 2016 Health Stamps. Back to 2015 Health Stamp Issue. The Theme of this issue is - Being Active. 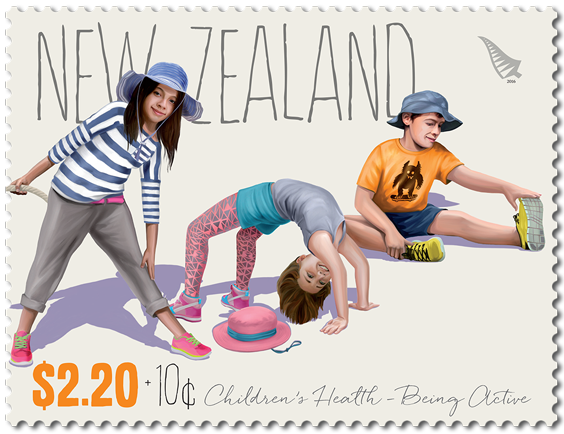 The 2016 Children’s Health stamps show how Kiwi kids can easily embrace a healthy and active lifestyle through regular daily exercise. Just 60 minutes of moderate to vigorous activity every day is all it takes for kids to build strong, healthy bodies and minds, and friendships too. Whether it’s walking or biking to school, playing sports at lunchtime or climbing the jungle gym – it’s all doable in a day for our kids at play! 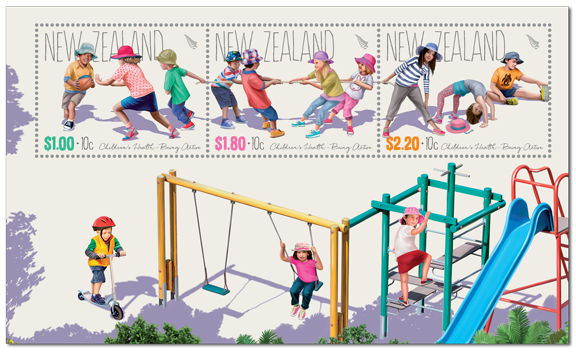 This beautifully illustrated stamp issue consists of three stamps that show children in simple, everyday play. 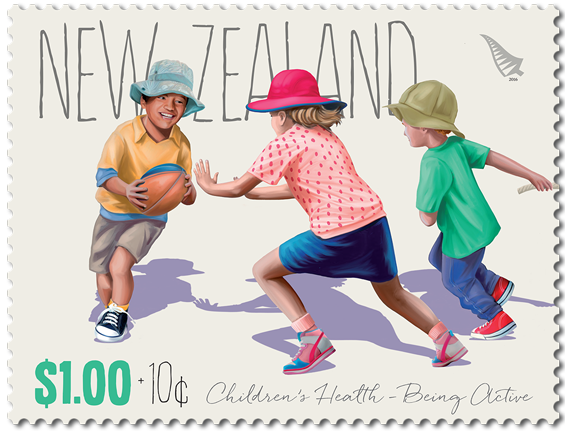 Each stamp represents one of the three key areas of exercise that help keep children healthy: aerobic activity, strength building and flexibility. Together, the three stamps form a seamless illustrated image, shown above and in the collectables further down this post. I like the way the children appear more lifelike and natural. 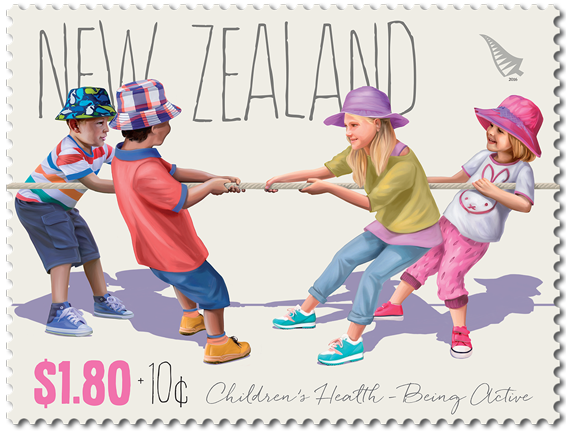 Ten cents from the sale of each stamp in this issue goes directly to Stand Children’s Services Tu Maia Whanau (formerly known as Children’s Health Camps). 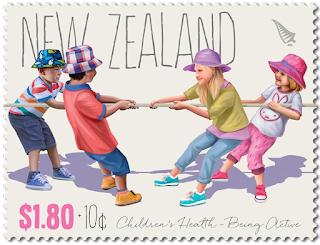 The stamps help to aid the valuable service that Stand provides to children and their families in need around New Zealand. 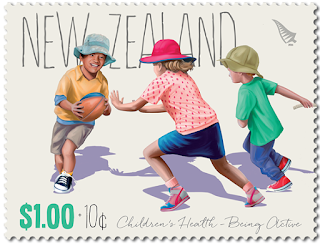 New Zealand Post has been a proud supporter of Children’s Health Camps not missing a single yearly issue since they began in 1929. You will find a complete set of all of these issues, including this one, in the indexed pages above. There were three values in this issue, large format illustrations showing kids at play, having fun & enjoying themselves while engaging in healthy activities at the same time. $1.00 + 10c - Aerobic. Let’s get physical! Boys and girls of different ages come together for a casual game of touch rugby. Kicking a ball around is a fun team sport that builds confidence and camaraderie. This aerobic activity increases the heart rate and helps to pump oxygen through the body. $1.80 + 10c - Strength. Build big, strong muscles and bones! With little more than a rope and a bunch of enthusiastic children, you can have a classic game of ‘tug of war’. A great all-over strength workout with endless fun and health benefits. $2.20 + 10c - Flexibility. Limber up the limbs! Exercise doesn’t have to be rigorous. Some gentle stretching during a PE class, at home, or at the park is all it takes to develop and maintain flexible joints. Available in this energetic issue is a miniature sheet, a first-day cover and a miniature sheet first-day cover. Each of these collectables features more imagery supporting the Being Active message, set in a leafy, park-like scene. You can spot the New Zealand native birds in the trees on the two First Day Covers? First Day Cover for the stamps. Notice the special cancel. 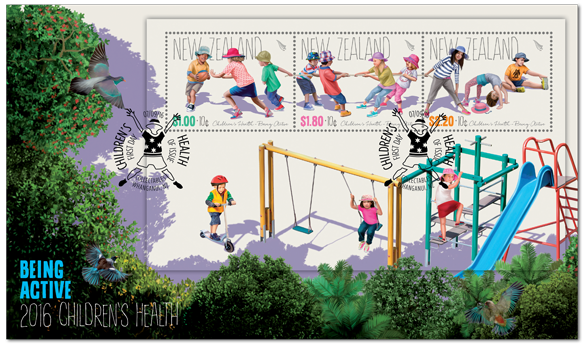 The Miniature sheet showing the three stamps plus children playing on swings. The Miniature Sheet First Day Cover. Gummed: $1.00 + 10c , $1.80 + 10c and $2.20 + 10c. Unless stocks are exhausted earlier, these stamps will remain on sale until 6 September 2017. First-day covers will remain on sale until 6 November 2016. 2016 75th Anniversary of the Navy. 2010 Matariki - Maori Kites.